UCOG Today [Paul Kieffer] » Blog Archive » Turn on the heat! That might seem like a strange request coming from the Gulf Coast area of the United States, but not after the last two weeks. Winter in Mobile, Alabama is usually a short affair. Even on those occasional days when the temperature dips below freezing overnight, it warms up during the day to be at least around 50 F or so (10 C). But not this year. After two weeks of freezing weather overnight, the creek behind our house froze over. It has been 51 years since Mobile has had so many consecutive nights with the temperature below freezing, and this year’s cold spell is only the third one of its kind since about 1940. It has been cold here, relatively speaking! People in the deep south have water pipes exposed to the air since it rarely freezes. When it does, making sure your pipes don’t burst can be a challenge. Fortunately that is not a problem at the house in Mobile, since the pipe from our water pump runs underground into the house. 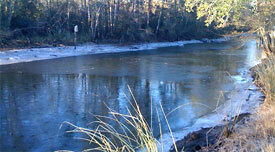 We woke up this morning to an icy view of the creek!